Rubble left from the former R.L. Stowe Mills still remains at the site which was vacated a decade ago Thursday, September 27, 2018 in Lupton City, Tennessee. 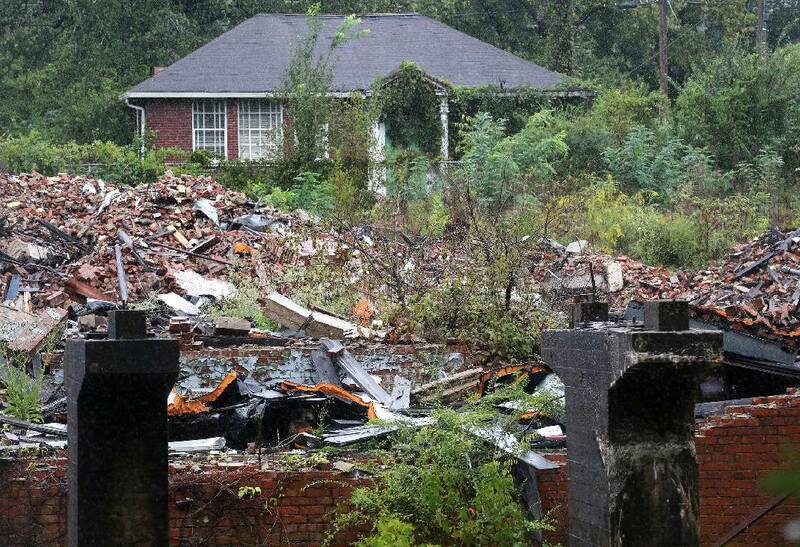 Crews were supposed to start cleanup by July or August, but the rubble still sits mostly untouched. Mark Mullins speaks during a news conference held by Lupton City residents to voice complaints about delays to clean up the the Lupton Mill site on Wednesday, Oct. 10, 2018, in Chattanooga, Tenn. Residents asked the city to expedite the cleanup, citing pollution, rats and and mosquitoes among their complaints. More than two years after Chattanooga Mayor Andy Berke and City Councilman Jerry Mitchell stood on the site of the partially demolished R.L. Stowe mill in Lupton City and promised to clean it up by the summer of 2017, the city is finally preparing to award a contract for the cleanup work to begin this spring. The Chattanooga City Council next Tuesday will consider a $1.7 million contract with Wright Brothers Construction Inc. to clean up and remediate the contaminated site on Mercer Avenue that once housed the Lupton City mill owned by Dixie Yarns and later R.L. Stowe. Wright Brothers submitted the lowest bid from among three contractors who made proposals for the mill cleanup. If approved by the council, the contractor should prepare plans by March for demolishing the rest of the structures still remaining on site, crushing the remaining materials, and capping the 11.8-acre site over the following six to eight months or so. "Residents should see movement at the site beginning approximately in April," said Colline Ferrier of Chattanooga's Department of Public Works." Any brownfield site remediation is complex, as you are dealing initially with unknown contaminants and it takes time to assess what needs to be done to remediate properly and to meet TDEC (Tennessee Department of Environment and Conservation) standards." Public Works Director Justin Holland and city engineer Bill Payne told council members Tuesday that the contractor will pile up creosote-coated wood in two areas, level the rubble and put an 18-inch earthen cap across the site, leaving an open green field. The work will include demolition of remaining structures and basements, separation of materials, placement of crushed materials, the relocation of an exiting storm drain line and the placement of 18 inches of clean soil over the mill site. Payne said the city could, if it wished, build pavilions or restrooms atop the two woodpiles, which would add concrete slabs atop the earthen cap. Future land use restrictions on some or all of the site are possible depending on the planned use and the presence of other contaminants beyond what the cleanup contract covers, Payne said. Chief of Staff Stacy Richardson said Hamilton County is going to deed its half-ownership to Chattanooga. The city then will look at how best the property can be used. 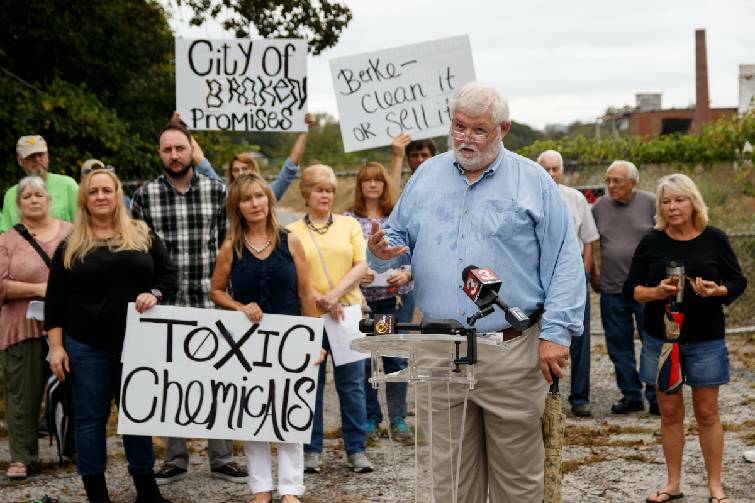 The city and county acquired the contaminated site after the former owners, Lupton City LLC, which is connected to the Dockery Group, in Peachtree City, Georgia, left the site and failed to pay property taxes on the land. The company began demolition five years ago and hauled away valuable wood and metal. But then work abruptly stopped, leaving behind a partially demolished mill building and a towering brick smokestack amid a field of rubble. The city and county acquired the property through back taxes. Lupton City residents have complained about the delays in cleaning up the mill property, but city officials said they want to make sure the mill site is properly cleaned up before either selling the property or considering other uses. The mill is located near the entrance to the 155-acre Riverton development on the riverfront site in Lupton City, where developers hope to eventually build 400 homes around a town village with neighborhood restaurants, stores and medical offices. The proposed $200 million-plus development is expected to be built out over the next five or six years and represents the biggest new residential development in the city in decades. Mark Mullins, president of the Fairfax Heights/Bagwell City Neighborhood Association, said Tuesday he had hoped that the Riverton developer would buy and clean up the mill site to help preserve it as a park. "We don't understand why it has taken so long and we had hoped that Riverton might get the mill site, but we're absolutely glad to see this cleanup work move ahead," Mullins said. Mullins said the neighborhood association would like to see Lupton City designated as an historic neighborhood, similar to St. Elmo, because of its unique and historic role as a mill town built in 1920 when John T. Lupton bought 1,000 acres of land near the Tennessee River and built the mill town of Lupton City for his Dixie Mercerizing Co., later Dixie Yarns. The mill later became R.L. Stowe Mills, which closed in 2009.